Regular readers will know that critical thinking involves knowing logical fallacies – recognizing them in other people’s arguments, and not using them in your own. But falsely calling fallacies is just as bad. Arguably worse, since using a fallacious argument just means you haven’t justified your argument - your argument could still be right for other reasons. Falsely calling a fallacy means you are saying something is wrong when it isn’t. Recently I was researching something for this year’s Golden Woo awards, when I came across a blog post titled New World Record? Six Logical Fallacies with a Single Sentence promoting Genetically Modified Food, written by someone called David Dilworth – and I thought ‘that’s just what I’m looking for. Six fallacies in one sentence! I have to see that.’ Unfortunately the sentence didn’t contain six logical fallacies. 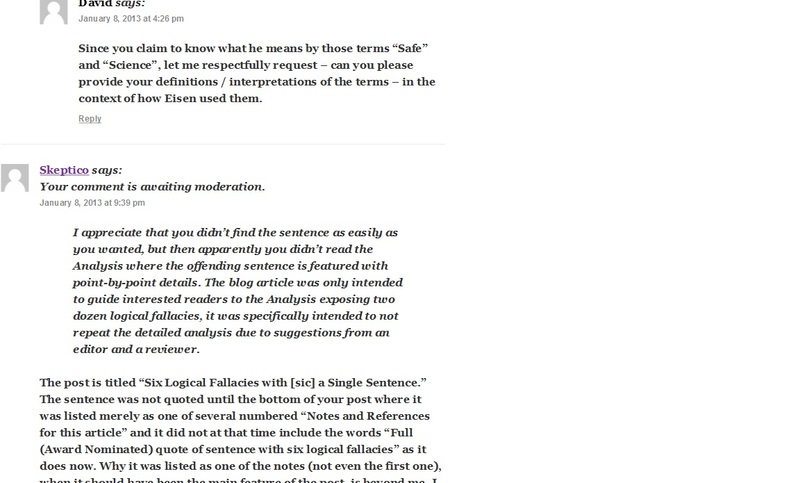 On the contrary, the author of the post was wrong on all counts and obviously didn’t understand logical fallacies. For the backers of the initiative to claim [ GMOs might be harmful ] as a finding of fact is an outright lie, and an outlandish attack on science. Obviously you can see the six fallacies in that sentence. No? Me neither. One of them (what he said was a non sequitur) could at a pinch be described as an assertion fallacy (something just asserted, not supported). A bit lame though, when taken in context with the rest of the article. One of the “fallacies” relied on something written in a different sentence, so it couldn’t have been a fallacy “in a single sentence” as claimed. I’m going to explain in detail where Dilworth is wrong. This post is going to be a bit long, but I think it’s worth doing because (1) I don’t like to see such nonsense standing unopposed, and (2) I do feel very strongly that understanding logical fallacies is a path to critical thinking and I hope that my analysis will shed light on what is, and on what is not, a logical fallacy. Does he mean “not harmful” or that the harms are only relative to the benefits? Dilworth is calling these fallacies because there are ambiguous meanings of “science” and of “safe.” This is ridiculous. As a logical fallacy, Ambiguity occurs when linguistic ambiguity causes the form of an argument to appear validating when it is not. Eisen isn’t doing this – he is not using linguistic ambiguity to try to win a point. He is simply using everyday words in the way most people understand them, with no attempt to benefit from ambiguity. Dilworth either didn’t read or didn’t understand his own link (the first hit you get when you Google “Ambiguity Fallacy”). At most Eisen is guilty of careless writing, but even that is a stretch. Dilworth is arguing like a lawyer – expecting every word to be fully defined with no ambiguity. But that’s not required to be free of fallacy. Eisen never mentions (or realizes?) that he and Food Safety proponents might each embrace science but have different philosophies or values. What really makes me uncomfortable is when Eisen claims high authority as spokesperson for “Science,” then he’s purporting to speak for me and anyone else who cares about science. David Dilworth is the editor of likely the largest database of environmental impacts which compiles the best available science on over 1,000 different kinds of environmental harms, mitigations, and thoughtful, reasonable alternatives to avoid those harms. That’s five uses of the word “science.” So Dilworth, according to his own reasoning, employed at least five Ambiguity Fallacies in this one post. (Of course they’re not fallacies, as I explained earlier. But Dilworth must think they are.) Dilworth doesn’t apply the same microscope to his own writing that he applies to the writings of someone he disagrees with. If he did, he might realize no fallacy had been employed by Eisen. There is no “debating advantage” to Eisen for using words that might be interpreted differently. Consequently there is no fallacy. Next, assuming he intends safe to mean “not harmful” his position (claiming there is no possible harm from GMOs) requires a Proof of a Negative fallacy. First thing – it is not a fallacy to say you can prove a negative. The fallacy is to say you can prove a universal negative. For example, I can’t prove there are no white crows. I can search the world and see millions of black crows, but that wouldn't prove there wasn’t a white crow somewhere. If Eisen had said GMOs were never dangerous, had never harmed anyone and never would, he would be claiming to have proved a universal negative. (He’d be saying there were no white crows, anywhere.) But he isn’t doing that. He’s saying that the claims of the backers of the initiative are wrong (or as he puts it, a lie). He’s not “claiming there is no possible harm from GMOs” as Dilworth puts it. He just says that the studies, evidence or whatever the backers of the initiative are claiming as facts, are not true (ie he’s just saying that none of the crows they have shown him, are white). Eisen has not claimed a universal negative, he is claiming a limited negative. That’s not fallacious. There is no compelling evidence of any harm arising from eating GMOs, and a diverse and convincing body of research demonstrating that GMOs are safe. Note, not “no possible harm”, but “no compelling evidence of any harm…” Different things. The first would be a fallacy, the second, not. Furthermore, Dilworth’s statement: “his position (claiming there is no possible harm from GMOs)” is not anything I can find Eisen saying. He doesn’t say that in the sentence, and I’ve searched his whole article and neither the phrase “no possible harm” nor “no harm” appear anywhere. So ironically, to build a case for a fallacy, Dilworth had to build a straw man fallacy of his own. Dilworth misunderstands this fallacy. The real fallacy is to ask opponents of the initiative to prove a universal negative – ie to prove that GMOs are never harmful. Ironically, that is what GMO opponents do and what Dilworth is doing elsewhere (see below under the heading “Main Article”). So #3 is definitely not a fallacy. Although Dilworth employed a Straw Man fallacy. His claim of a “lie” is false since it is a Non-Sequitur fallacy (it does not follow). That’s because committing a lie requires more than making a false claim, it requires the person making the claims to understand it is false. Not really. All fallacies, strictly speaking, are non sequiturs (ie the conclusion doesn’t follow from the arguments presented). But the Non Sequitur fallacy refers to a conclusion that simply has no logical connection at all to the argument’s premises. Read, for example, the rational wiki on the non sequitur. See their examples – Eisen’s “lie” doesn’t really fit. If you accept for the sake of argument that the claims are false, a lie is one possible conclusion, and not something that simply has no logical connection. If anything, this would be argument by assertion (ie he hasn’t shown it is a lie), but IMO it’s really just a bit of careless writing. First thing: the “while I’m sure they have a reference that justifies their making this assertion…” wording comes in the previous sentence. Therefore, this is not a fallacy in “a single sentence” as Dilworth puts it. More to the point, it’s not contradictory at all. It’s quite possible for people to have studies and references, and to quote them when needed, while at the same time knowing the studies and references are lies. This should be obvious. worthless, making it a mere opinion; not a logical argument. “Proof” without facts is called a Proof by Assertion fallacy. Dilworth is double counting. By that argument, any fallacy is automatically two fallacies – the original one, plus proof by assertion, since the original fallacy means the argument has no valid support (that’s what a logical fallacy is) and is therefore just assertion. So #6 is not a fallacy. Also, Dilworth’s “there is no attack on science, no lie” claim is in fact two arguments by assertion of his own – Dilworth hasn’t demonstrated there is no attack on science and he hasn’t demonstrated there is no lie. He just tried to create ambiguity by introducing different definitions of science. He also demonstrated that Eisen hadn’t proven a lie, but he didn’t prove there is not one (we just don’t know). At a stretch there is one logical fallacy (assertion that there was a “lie”). A bit lame though IMO, and not a major part of Eisen’s argument against the initiative. Dilworth’s arguments to support two of the claimed fallacies involved his using a straw man fallacy, and two assertion fallacies of his own. One of the claimed fallacies “in a single sentence” actually occurred in a different sentence. Why Dilworth thinks this is a fallacy “in a single sentence” is beyond me. Dilworth’s entire post is one huge Argument by Assertion fallacy, since he didn’t explain in his post either (a) which sentence he was talking about or (b) what the fallacies were. Consequently Dilworth was just asserting there were six fallacies; he didn’t demonstrate that there were. I could argue this was six Argument by Assertion fallacies. Since you claim to know what he means by those terms “Safe” and “Science”, let me respectfully request – can you please provide your definitions / interpretations of the terms – in the context of how Eisen used them. Shifting the Burden of Proof Fallacy, Argumentum ad Ignorantiam. The above quote also falsely implies that the burden of proof is now placed with Food Safety proponents. Duh, of course the burden of proof is with those claiming GMOs are unsafe. The burden of proof is always with those making the positive claim. GMO proponents can’t possibly prove a universal negative – that GMOs cannot possibly cause harm. That is the fallacy – asking for proof of a universal negative - and yet it’s what Dilworth expects Eisen to do. And get this: Dilworth, in this paragraph, expects Eisen to prove a universal negative. But in Dilworth’s “Fallacy #3” he accuses Eisen of claiming he had proved a universal negative and then states that this is a fallacy. So according to Dilworth, it’s a fallacy if Eisen claims to have shown GMOs are safe and it’s a fallacy if he says he can’t show GMOs are safe. Astonishing. This is what happens when you don’t understand what you’re talking about. Also (couldn’t resist this one) Dilworth brings up Thalidomide – yes Dilworth is invoking the Science Was Wrong Before fallacy. The article's overarching theme is based on a fallacy formally called "Special Pleading." It means he attacks opponents for not meeting a set of standards (apparently "science reasoning") - while he violates those same standards (presumably you won't detect them). In short, hypocrisy. First, no it’s not Special Pleading unless Eisen explicitly stated that different standards apply to him (another fallacy name learned, but not understood). Regardless, behold the chutzpah – Dilworth’s fallacy filled article (falsely) accuses Eisen of hypocrisy, for (drumroll) using fallacies. Breathtaking. Dilworth’s posts are bad – maybe even A Straw Man gets AIDS bad. To call fallacies correctly, you have to understand them, and to do that you need to understand why they are fallacies. Dilworth gives the impression that he has just learned the names of fallacies without understanding them, and then tried to fit them to an article he disagreed with. To do critical thinking, you also have to examine your own arguments, and if you find they contain fallacies you try to re-write them without the fallacies. (And if you can’t, you consider changing your position.) Dilworth neglects to do this on an epic scale. The writings of woos are generally full of logical fallacies and claims not consistent with evidence. Dilworth’s articles are worse than most because his many errors and fallacies are dressed up in the language of critical thinking. But Dilworth is not a critical thinker, he is just an unorganized writer and confused thinker who decided to to fit the names of logical fallacies to an article whose conclusions he disagreed with. That’s not the way to do it and it’s why his articles are so completely wrong. He should delete these posts which are an embarrassment and apologize to Eisen for accusing him of hypocrisy. "...using a fallacious argument just means you haven’t justified your argument - your argument could still be right for other reasons. Falsely calling a fallacy means you are saying something is wrong when it isn’t. " I believe you've made a bit of a mistake there. Falsely calling something a fallacy does not necessarily mean you are saying something is wrong when it isn’t. Calling a false fallacy also just means you haven't supported your position, since that something may still be wrong for other, valid reasons. It does mean that it isn't wrong for the fallacious reason supplied, but calling a false fallacy does not automatically make the other person right. That's correct. I guess I didn't write as well as I thought I had. What I meant is, you're calling something a fallacy, that isn't. Of course, you're correct to say that the argument could still be wrong. ... finding a new Skeptico post is like finding a 5 Dollar bill on the pavement: unexpected and pleasant. I was reading the comments thread on Dilworth's site, and was fascinated at how he apparently believed that he is soundly thrashing you in the logical discourse when it is apparent to me he is vastly over matched by you. At times some of his comments reminded me of Bill Clinton's famous, "It all depends on what your definition of what the word IS is." testimony. Thanks Karl. I'm going to try to write a few posts this year. It won't be in the numbers from 1995-97, but should be more than 2012. I’m impressed that you read that comment thread. Dilworth does argue like a lawyer trying to find a loophole. He stubbornly insists that if you use an ambiguous word, it’s a fallacy. I've never met anyone who thinks such a thing before - it's just bizarre. I'm trying to find a way to get him to understand where he is wrong, but he is an expert in missing the point. And we're only on falsely called fallacy number one out of nine. It looks like this could be a long debate. Or maybe not. He holds comments "in moderation" for days and days. Look at his last comment - I replied to that on Sunday morning. It's now Thursday night, 4 1/2 days later and it still hasn't appeared. I'm not holding my breath. Pleased to see you've got something up. I can look forward to the occasional gem this year. I posted a detailed rebuttal to all of his points, including exposure of his dishonestly trying to cover his tracks and lying about it. If Dilworth would release comments, instead of holding them for up to a week, you would be able to read it. I will post a short summary of Dilworth's dishonesty though, later today. I just posted David Dilworth–Dishonest and a Liar–Also Still Wrong - a short summary of Dilworth's dishonesty, with questions he needs to answer. To reduce confusion, I'm closing comments on this post. Please feel free to comment on this subject at the new post.